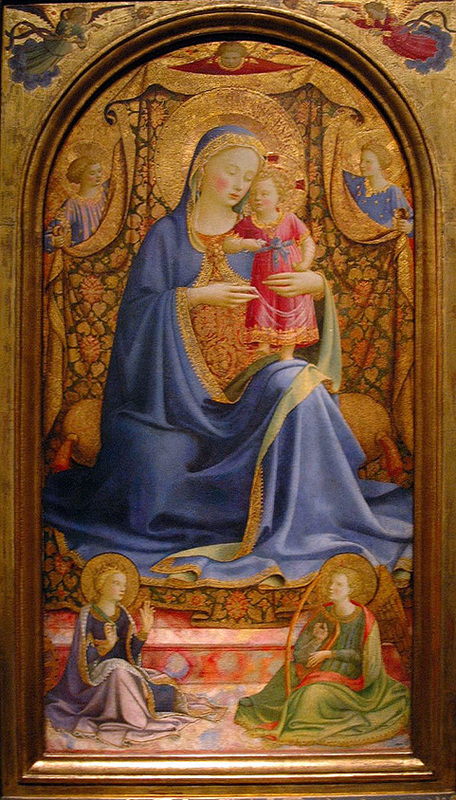 The iconography of the Madonna of Humility, in which the Virgin is shown seated on a cushion placed directly on the ground, was first taken up by Fra Angelico in one of his earliest surviving paintings, the Virgin and Child, with Four Angels, in the State Hermitage Museum, Saint Petersburg (fig. 11). In that painting, which probably can be dated shortly before 1417, the cushion rests on an elaborately brocaded carpet that extends continuously from the "horizon" to the foreground, following a model employed on several occasions by Angelico's master, Lorenzo Monaco. Two small angels kneel in lost profile in front of the Virgin, and two more hover in adoration at either side and, notionally, behind her, simultaneously complementing the line of her silhouette, which is traced against the gold ground of the panel, and establishing the corners of the box-like space in which she is contained. For the Thyssen panel, painted perhaps ten years later, Angelico's model shifted decisively from the Late Gothic masterpieces of Lorenzo Monaco to the revolutionary new style of Masaccio. Here, the Virgin's cushion is situated on a raised marble step or dais, and its gilt and glazed pattern is expertly foreshortened and seen from a lower viewing point than that adopted in the Hermitage panel (in which pictorial space is constructed empirically, not perspectivally).Three angels hold up an embroidered cloth of honor behind the Virgin — a device not unknown in fourteenth-century Florentine painting but in this specific configuration obviously a direct reference to Masaccio's Virgin and Child with Saint Anne in the Uffizi.Two music-making angels are seated in the foreground: the one on the left, in three-quarter profile, is playing a portative organ, and the angel on the right, shown frontally, is strumming a lute. (*1) Their heads are tilted upward and their eyes are rolled back as they glance toward the Virgin and her son.The Christ Child stands on his mother's raised left knee, leaning on her shoulder and pressing his forehead against her cheek as he proffers her a lily, symbolic of her purity. The Virgin holds a vase of red and white roses in her right hand. The Thyssen Madonna was among the first of Fra Angelico's paintings to enter an English collection, having belonged to Princess Charlotte of Wales not later than 1816, when it possibly was presented to her as a wedding gift by her father, King George IV. (*2) Upon the death of Princess Charlotte in 1817, the painting remained in the possession of her husband, Leopold of Saxe-Coburg — from 1831, King of Belgium — and was sold by his son, Leopold II, in 1909, at which time it entered the collection of J. Pierpont Morgan in New York. (*3) It was acquired by Baron Thyssen in 1935 from The Pierpont Morgan Library, and only recently has been on public display: first at the Museu Thyssen at Pedralbes, and now in the Museu Nacional d'Art de Catalunya. While scholars have always been aware of its existence, opinions regarding its authenticity and date have vacillated widely due in large measure to the painting's relative inaccessibility. A thorough summary of these opinions was included by Miklos Boskovits in his exemplary catalogue of Italian paintings in the Thyssen Collection;(*4) the author offered a vigorous and fully justified defense of the painting's autograph status and proposed a date for it between about 1433 and 1435, contemporary with the Linaiuoli tabernacle (see cat. 29). Although accepted in the latest literature on the artist, a date in the mid-1430s for the Thyssen Madonna is problematic. The evidence adduced by Boskovits in support of this contention is on the one hand subject to alternative interpretations and on the other based on an unconvincing late dating of such paintings by Angelico as the Santa Maria degli Angeli Last Judgment, once thought to be a documented work of 1431 but now recognized as a considerably earlier effort, possibly from about 1424 (see p. 80). The figure types employed in the Thyssen Madonna, with their short, rounded proportions, do not occur in any paintings securely datable in the fourth decade of the fifteenth century. They are, instead, encountered regularly, and exclusively, in paintings reasonably situated between about 1425 and 1428/29 — a dating that also conforms better to the type of Gothicizing capital letters used by the artist to embellish the Virgin's halo (inscribed, AVE MARIA GRATIA PLENA), the border of her mantle, or the Child's halo (inscribed, ALFA/OM[EGA]). 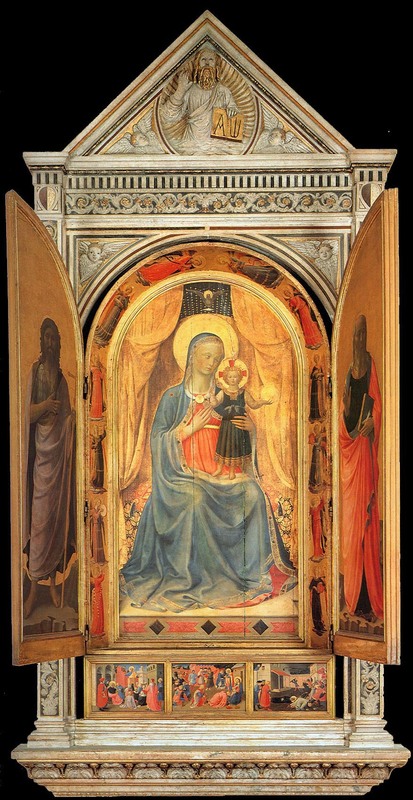 (*5) Only the round-arched, "Renaissance" format of the Thyssen Madonna and its sophisticated depiction of space might be said to justify a later date, but assuming that Angelico's model for this painting was, indeed, Masaccio's Sant'Anna Meterza altarpiece of 1424, it becomes difficult to explain why a full decade might have passed before Angelico formulated a response to this example when he otherwise appears to have reacted almost immediately to the younger painter's innovations. A more compelling argument can be advanced for accepting the Thyssen picture among Angelico's earliest experiments with this compositional model, immediately following the Prado Annunciation altarpiece and the Alba Madonna of about 1426 — the artist's first clearly articulated responses to Masaccio's radical approach to the construction of pictorial space and tactile form (see pp. 81-83). The virtual identity of figure types in the Alba and Thyssen panels tends to confirm this hypothesis, as do the uncompromising frontality of the Thyssen Madonna, which has been described as "archaizing",(*6) and the relatively tentative solution adopted to justify the poses of the two foreground angels, whose heads are tipped up and slightly backward to glance at the objects of their devotion. Angelico painted a second, more successfully thought out version of this composition; now in a private collection in Switzerland (fig. 61), it is, however, less well preserved. In this work, all of the experimental uncertainties of the Thyssen panel have been resolved. The Virgin is turned noticeably to her left, engaging her son in a more active embrace, in a pose that breaks with the rigid frontality of the Virgin in the Thyssen painting. The two figures seated in the foreground, Saint Catherine of Alexandria and a harp-playing angel, no longer make a pretense of looking back at the Virgin, and the three angels holding up the cloth of honor are more aggressively foreshortened as they strain forward in a touchingly realistic effort to see around the loops of cloth that separate them from the Virgin and the Child. The figure types in this painting associate it unmistakably with the Franciscan altarpiece of about 1428/29 (cat. 24), which thus becomes a terminus ante quem for the Thyssen Madonna. Given the latter's striking resemblance to the Alba Madonna, a date of about 1426/27 seems reasonable for it. Based on its scale and exceptionally elongated proportions — its painted surface is almost exactly twice as tall as it is wide — Collobi-Ragghianti as well as Boskovits proposed that the Thyssen Madonna probably originally was the center panel of an altarpiece. 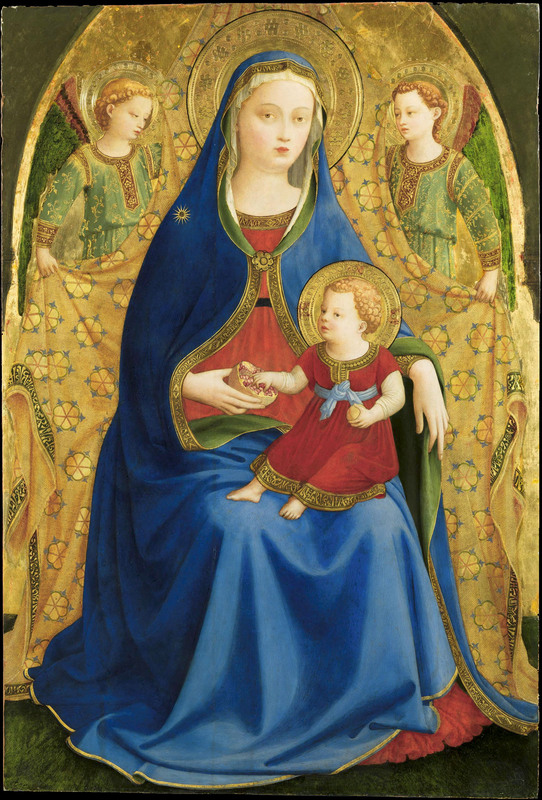 (*7) This contention is not borne out by comparison with Angelico's other paintings from the 1420s that demonstrably served this purpose, such as the center panel of the San Pier Martire triptych, which is proportionately wider (107 x 57 centimeters), or the Pontassieve Madonna in the Uffizi, which is proportionately much taller (132 x 57 centimeters). Additionally, no surviving polyptych by Angelico is composed of round-arched panels. It is more likely that the Thyssen Virgin and its "replica" in Switzerland were conceived as independent devotional panels framed by an aedicular tabernacle of the type then being popularized by Brunelleschi and his followers. Sometime between the execution of these two paintings, probably in 1427, Angelico was called upon to paint a more traditionally Gothic, ogival-arched tabernacle with movable shutters (cat. 21); he reverted to a round-arched format in his later, Linaiuoli tabernacle (see cat. 29), designed in 1433 to fit a frame carved in Lorenzo Ghiberti's workshop that employs an ornamental vocabulary of decidedly Gothic proportions. Whether the frames of the Thyssen and Swiss panels similarly were designed by Ghiberti or in his style, or whether, instead, they more closely followed Brunelleschi's classicizing models cannot now be determined. A third possibility is that both panels were framed by simple casetta-type moldings and were designed to be hung on piers in a church, on the model of two paintings presumed to be copies of a lost Virgin of Humility, with Angels, by Orcagna - one by Jacopo di Cione in the National Gallery ofArt,Washington, and one by Don Silvestro dei Gherarducci in the Galleria dell'Accademia, Florence. (*1). The angels may have been adapted from the composition of a relief by Donatello known in three surviving examples: a stucco squeeze and a later marble replica in the Victoria and Albert Museum, London (Pope-Hennessy 1964, nos. 74, 73), and a stucco squeeze in a New York private collection (Butterfield 2000, no. 1; Giurescu Heller 2002, no. 2).The lost prototype for this relief, possibly a bronze meant to decorate the door of a sacrament tabernacle, seems to have provided the model for the center panel of Masaccio's Pisa altarpiece of 1426, and either that prototype or a replica almost certainly was known to Angelico by this date as well. The three reliefs in London and in New York differ from one another in minor details, suggesting that they are the surviving members of a once more numerous class of object rather than direct copies either of the lost original or of each other. The stucco version in New York, the earliest of the three, retains its original frame and some of its original pigmentation. (*2). Boskovits 199o, p. 26. Among the known paintings by Angelico, only the Gardner Dormition and Assutnption of the Virgin (cat. 28) can be shown to have been in an English collection so early in the nineteenth century. In 1857 (Cartier 1857, p. 444), it was claimed that the Thyssen painting came from the Palazzo Gondi in Florence, but it cannot be ascertained whether this provenance was based on documentable information or was simply a fanciful reference to Vasari's statement that three paintings by Angelico, "un quadro grande, un piccolo, ed una croce," were the property of Bartolomeo Gondi,"amatore di queste arti al pari di qualsivoglia altro gentiluomo," in 1568 (Vasari [Milanesi ed.] 1878-85, vol. II, p. 512). (*3). Boskovits 1990.The purchase of the painting for his own collection by Morgan, then Chairman of the Board of Trustees of The Metropolitan Museum of Art, was the cause of a rift between him and the Museum's curator of paintings, Roger Fry, who had been trying to procure the painting for the Museum. See Pope-Hennessy 1984, p. 238. (*4). Boskovits 1990, pp. 22-29. (*5). Boskovits (1990, p. 27 n. 21) observed that this type of lettering forming the words of prayers first appears in paintings by Angelico beginning with the Alba Madonna, which is here dated about 1426 (see p. 83). C. Gomez-Moreno (1957, pp. 188-89) argued that this lettering does not recur in Angelico's oeuvre after the early 1430s, a contention accepted by Boskovits with some reservations. 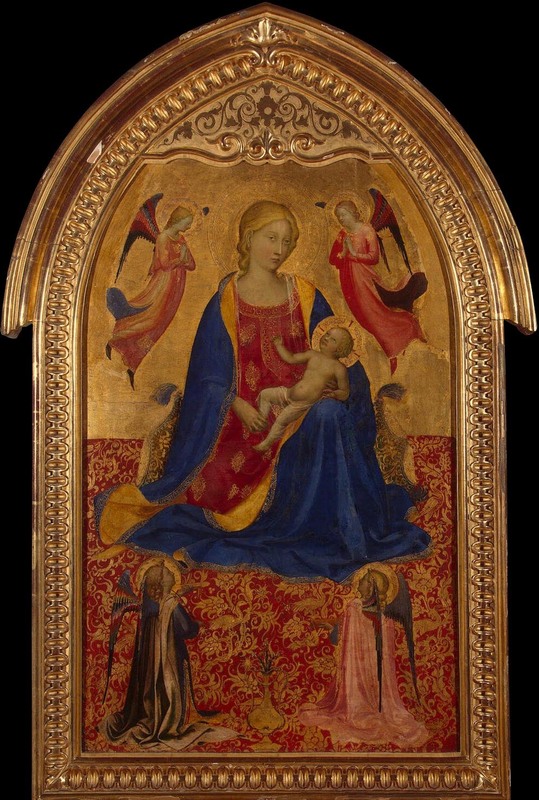 It should be noted that the system employed in the Thyssen Madonna of modeling the folds of the cloth of honor with translucent glazes superimposed on a continuous, uninflected fabric pattern is also more typical of Angelico's early works than of his paintings of the mid-1430s, as was specifically observed by Boskovits although not pursued by him to its logical conclusion. (*6). Boskovits 1990, p. 29. (*7). Ibid., p. 24; Collobi-Ragghianti 1950 b, p. 25.